TCP COM Bridge is a utility program that works as an RS232-TCP/IP software converter and allows to forward data from a physical or virtual COM port to an Ethernet network. TCP COM Bridge is a utility program that works as an RS232-TCP/IP software converter and allows to forward data from a physical or virtual COM port to an Ethernet network. Using this program, you can turn any computer into a "serial device server." 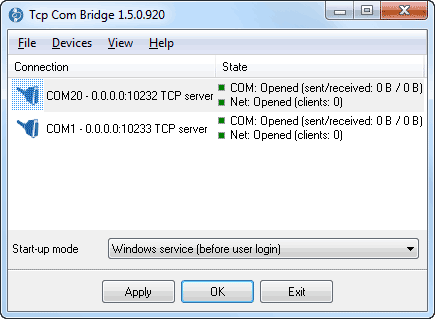 TCP COM Bridge lets you create a connection between two COM ports on two different computers, even via the Internet. This way, you can build distributed data collection systems using legacy software. EMS SQL Manager for SQL Server is a high performance tool for Microsoft SQL Server database development and administration. SQL Manager works with any MS SQL Server versions from 7 to the newest one and supports the latest SQL Server features. dotConnect for Oracle is an enhanced ORM enabled data provider for Oracle that builds on ADO.NET technology to present a complete solution for developing Oracle-based database applications. EMS SQL Management Studio for MySQL is a complete solution for database administration and development. SQL Studio unites the must-have tools in one powerful and easy-to-use environment that will make you more productive than ever before!